When questions come up about a task, Project gives you several ways to get instant answers. Hover over a name and click Send an IM to start an instant message session in Skype for Business. Note: Don't see this, or don't want to see it? You can turn online status on and off in Project Professional 2016. You can also start a call, a video chat, or send an email with one click using Skype for Business. Learn more about using Skype for Business in your company to communicate with team members. Make sure you’re in a view that shows people’s names in order to use Skype for Business, such as the Resource Sheet, Team Planner, or Task Usage views. 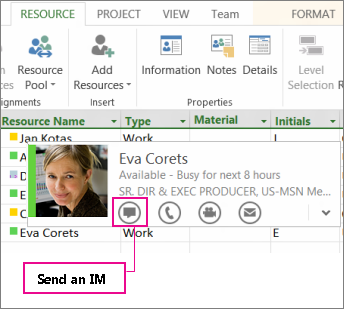 Note: To use IM or video chatting within Project, you need Lync 2010 or Skype for Business installed on your computer, and team members added to your project using Active Directory or the Address Book. Learn how to add people to your project.